This is the second page for the fabulous Diane Hodrick’s recipe page swap. I am so pleased with the pages from the first round of the swap that I have already received, and I can not wait to see what treasures will arrive with the new round – soups and salads. This is a page for an easy White Bean Chicken Chili recipe. With ingredients such as jalapeno, cumin, oregano, and garlic, I thought this recipe page would need something with a southwestern feel. 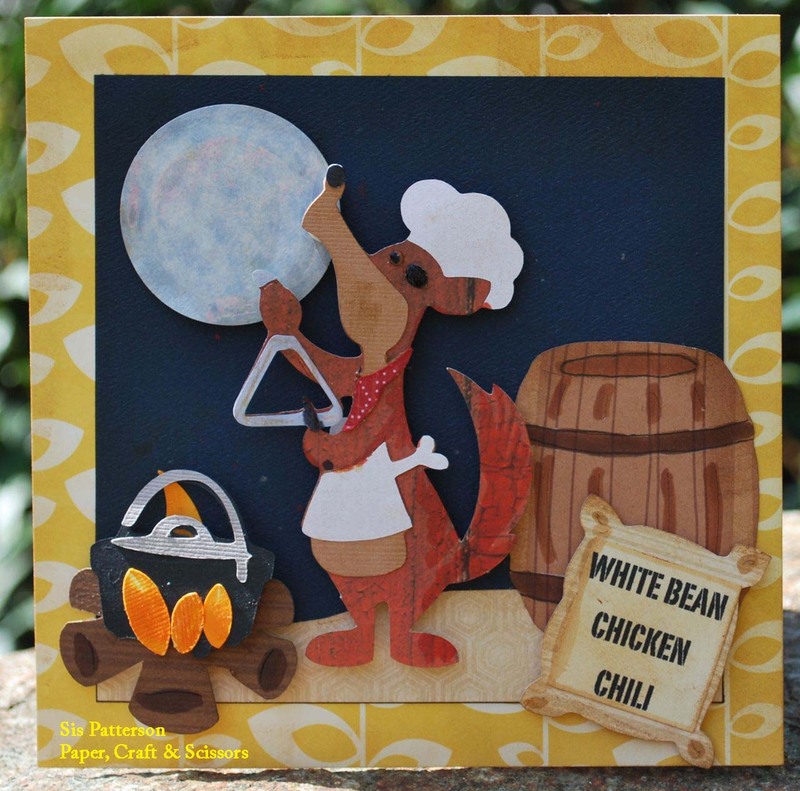 And here he is – a cooking coyote with a dutch oven in the campfire from the Campin’ Critters cartridge. The barrel and the bag of beans are from Paper Doll Dress Up. The moon was made with a series of 3 circle punches – one of patterned paper and two smaller from chipboard. I gave the moon a once around with a Copic C2 marker and then gave it that healthy dose of Diamond Glaze. I really like the dimension of the moon – and I think it all lines up rather nicely into a fun 6X6 inch page. I have a soft spot for all those cute critters from that cart, but your details really make this wonderful. Great job! Holy Guacomole (or white bean chicken chili as it may be) this is stinking adorable! You do the best recipe cards! Well, I knew you’d do it again, but Oh My Gosh – You’ve done again! 🙂 This is so adorable! I love your bright 6×6 background choice behind the dark night sky! I put my face about 1/2 inch from the laptop screen to check out that cool moon – it looks so real, I think I can see the craters. Love all the shading and the details you have colored onto this. I love every image on the Campin Critters cart….and am thrilled to see this one placed smack in the midst of the desert with his campfire chili and his fun triangle, apron, and chef’s hat. I agree that you absolutely are the queen of recipe cards. I am blown over at how many pieces you cut and the detail you added again. The bag of beans with your recipe title is so clever. Absolutely LOVE it….in case you couldn’t tell. I was right there with Diane, getting a closer look at that moon! This is darling with your western chow wagon “cookie” and his accessories! I love the painterly feel of the elements— really gives it so much interest!!! (Perfect font choice BTW for the title – and too cute the way you incorporated that into the scene!) I don’t know how anyone in the swap is ever going to actually cook anything– I would be so distracted by the artwork in the book!! What a great page!! Now I want to go camping, and take my dutch oven and make white bean chicken chili!!! The details are fabulous!!! Wow, I wish I could shrink myself and sit at that campfire! He’s great!! This is a great recipe page. I love what you did to the moon and most of all I love the bag of beans!!!!!! So creative! Wow! So cut! Love this!